King of Egypt from 285 to 247 B.C. He continued the struggle for Cœle-Syria and Palestine and established himself permanently in possession of those countries about 274. Like all Diadochi, he took, pleasure in building cities; and Philadelphia (Stephanus Byzantius, s.v. ; Jerome on Ezek. xxv. 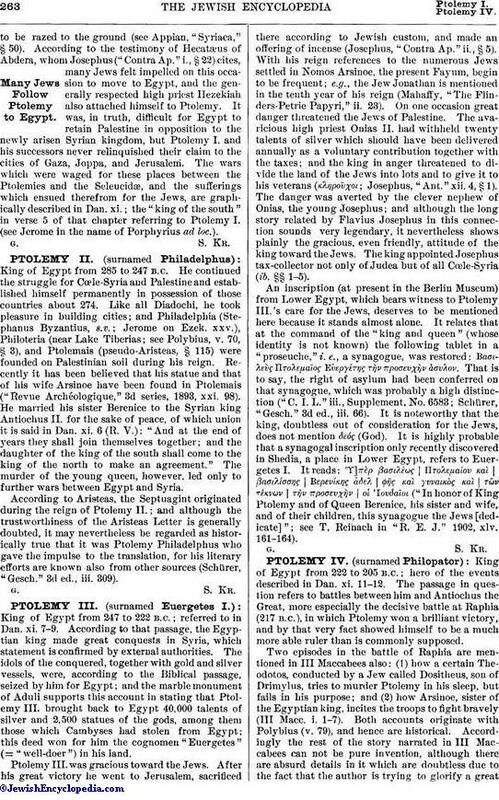 ), Philoteria (near Lake Tiberias; see Polybius, v. 70, § 3), and Ptolemais (pseudo-Aristeas, § 115) were founded on Palestinian soil during his reign. Recently it has been believed that his statue and that of his wife Arsinoe have been found in Ptolemais ("Revue Archéologique," 3d series, 1893, xxi. 98). He married his sister Berenice to the Syrian king Antiochus II. for the sake of peace, of which union it is said in Dan. xi. 6 (R. V.): "And at the end of years they shall join themselves together; and the daughter of the king of the south shall come to the king of the north to make an agreement." The murder of the young queen, however, led only to further wars between Egypt and Syria. According to Aristeas, the Septuagint originated during the reign of Ptolemy II. ; and although the trustworthiness of the Aristeas Letter is generally doubted, it may nevertheless be regarded as historically true that it was Ptolemy Philadelphus who gave the impulse to the translation, for his literary efforts are known also from other sources (Schürer, "Gesch." 3d ed., iii. 309).